Matt provides assurance services such as audits, reviews and compilations to nonprofits and companies in various industries, including construction and manufacturing. 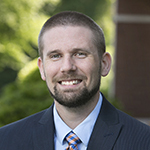 A recent Liberty University grad, Matt has found interest in employee benefit plan audits and consulting with business owners. As a QuickBooks Pro Advisor, he helps owners set up and maximize QuickBooks’ capabilities. Matt also works with owners to strengthen their reporting by capturing data from multiple sources to provide useful management reports. Outside of the office, Matt is interested in American History, golf, and spending time with his wife and toddler daughter. We're looking for exceptionally motivated professionals to join our fast-growing team. Apply Now! Not only does Meadows Urquhart provide accounting and tax services, but we’re also forward-thinking CPAs & consultants who take the time to step into our clients' shoes. We offer services for businesses, high-net-worth individuals, nonprofits and hedge funds. We're proud to be a part of this client's success story. Click on the shoes to learn more. Meadows Urquhart is a CPA & accounting firm located in Richmond, VA.